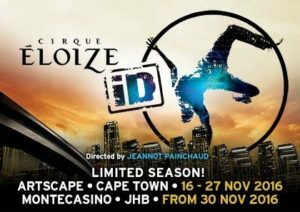 Everyone in Cirque Éloize — whose show, ID, is on at Artscape in Cape Town until Sunday November 27 — is eloquent in “body”, a language we can all understand yet only a tiny minority will ever master. It is a trip and a treat to watch these acrobats, gymnasts, riders, jugglers, contortionists and skaters tell stories and describe situations with their bodies. After a sell-out run at Montecasino in Johannesburg three years ago, the Montreal-based company is making its Cape Town debut at Artscape. They are visiting South Africa after a run in London, where the show played to full houses and rave reviews. The cast of superbly talented and ridiculously twisted (or do I mean flexible) artists bounce around the stage and off the props and the trampo-walls for 110 action-packed minutes. 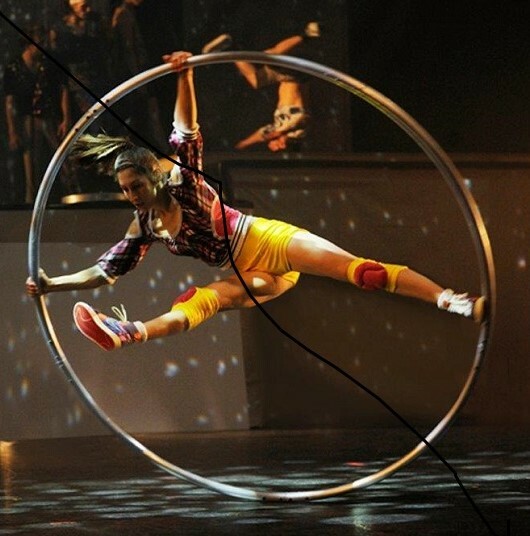 They lift and toss each other with ease, spin in graceful circles in hoops, on a bike and blades and skates, and even while suspended from silken ropes attached to the ceiling. 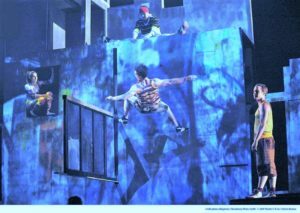 The detail of a variety of interactions and situations, from street fighting to romance, is played out through a thrilling, high-octane combination of dance and acrobatics. The clothes, the swagger, the moves all shout urban! street!, even sometimes gangsta! It is hip and hard, fast and furious yet nuance and emotion is surprisingly evident too. I am guessing this is the slickest representation of what our young adult selves, past and present, think being uber cool looks like. This is cool on steroids, which is fun to watch whatever your age. The audience gasps as they see glimpses of raw talent that no amount of training could mimic. The thrill of the ride is quite often supercharged by mini shocks of fear and disbelief as the performers go beyond what seems possible. We are taken to the edge a few times, but the performers somehow pull off each act of daring, usually at the last minute. Unity and discipline combine to turn the gangsta vibe into something almost poetic. It is a language that is familiar and completely alien. It’s fun, it’s mad, you won’t see anything else quite like it. Buckle up and enjoy the ride. After Cape Town, the company, which has presented more than 4,000 performances in around 500 cities in more than 50 countries, moves to Montecasino’s Teatro for a limited season (November 30 to December 24).